Truck Accident Amputation Injury Damages | Hupy and Abraham, S.C.
What Can You Recover After a Truck Accident Amputation? Maybe your amputation happened at the scene of the truck crash or maybe it happened later because of significant nerve damage or an infected wound. Regardless of how it happened, your life has been changed forever because of the negligence of a trucker, a trucking company, a truck manufacturer, a truck maintenance worker, or someone else. Life will never go back to what it was prior to the truck wreck. 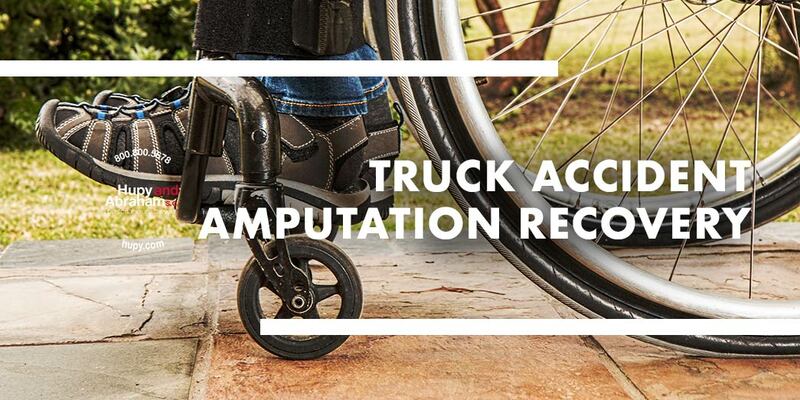 Whether you lost your arm, hand, finger, leg, foot, or toe immediately due to the trauma of the truck wreck or later due to the injury that you suffered in the truck wreck, you must live the rest of your life without your limb or digit. Medical expenses. Medical expenses include but are not limited to surgeries, medications for pain and to prevent infection, assistive medical devices such as prosthetic limbs, and rehabilitation therapies such as physical therapy. Lost income. You may be unable to work the same job or the same hours that you did prior to your truck accident injury resulting in lost wages. Out-of-pocket costs. Miscellaneous expenses such as childcare and household help may now be necessary, even if you didn’t need outside help prior to your truck accident. Pain and suffering. Your physical pain and emotional suffering may be the most significant part of your damages. In some cases additional compensation may be available. In order to make a fair recovery, you are going to have to prove that someone else was at fault for the truck accident and you are going to have to prove the value of your injuries. This will require evidence from the accident scene, a thorough investigation into the cause of the crash, and medical documentation. An experienced truck accident lawyer can help you with the investigation, with gathering evidence, and with convincing the insurance company or the court to provide you with a fair recovery. For more information about recovering from your truck accident injury, please contact us online or call us at 800.800.5678 for a free, no-obligation consultation.